AllNetic Working Time Tracker utilizes automatic algorithms to help user remember when he/she needs to start or stop time tracking. However, the application will never do it by itself. Only the user decides what he/she does at the moment. You can customize automatic hits to your needs or disable them if you want. Select Computer assistance tab in the application options. 3. Minimum period length to keep the period in records. To understand each option in detail, let us go through the assistance algorithm. You do not want computer to bore you with reminders, so the application waits until the user leaves the computer (Choose waiting time in option 2, 180 seconds recommended). To detect this situation reliably, the application tolerates some random events, e. g. you may push you table accidentally and move the mouse a bit. (Choose time in option 3. 5 to 10% of option 2 time is recommended). In other words, the application starts inactivity waiting time counter right after your last keystroke or mouse move before you leave. If during this time the casual activity is not more than 5 to 10%, the application will consider it as real inactivity. Now the application will track when the user resumes his/her work. Some tolerance of casual events is needed too. The application waits specified time (choose option 4, 60 seconds recommended). 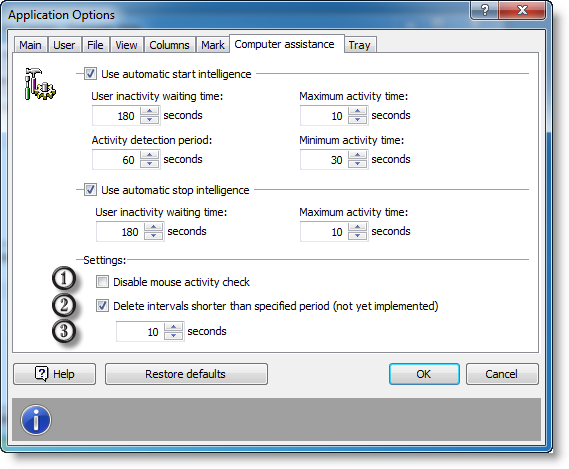 If during this time some significant activity (during time set in option 5, 50% of option 4 recommended), the application proposes to start time tracking. You just need to select what you are working on. In other words, the application starts activity waiting time counter as soon as the time tracking is stopped, and if you activity during this time is more than 50%, the application proposes to start time tracking. Automatic tracking stop algorithm works in the same way. The application is continuously tracking the user activity. 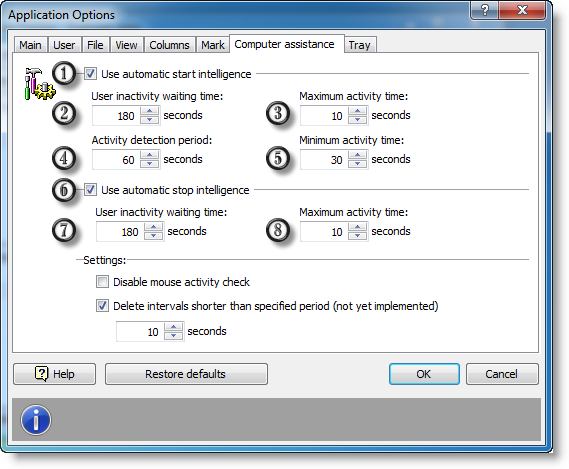 If during the specified time (choose time in option 7, 180 seconds recommended) the user was not active enough (choose time in option 8, 5 to 10% of option 7 time is recommended), the application will propose to stop time tracking. Our experience shows that some models of mice may flicker even if nobody touches them. Sometimes this happens because of low-quality daylight lamps that shimmer on the mains frequency. If this is the case, you can disable mouse tracking at all. Also you can use short period deletion feature that is handy to harness casual tracking starts. AllNetic Working Time Tracker will delete all short accidental periods automatically.